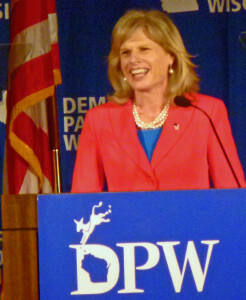 Mary Burke speaking at state convention in the Dells. A WisPolitics straw poll shows conventioneers overwhelmingly back Burke for the party’s gubernatorial nomination and favor Hillary Clinton for president in 2016. Burke is a former Trek Bicycle executive and former Commerce Secretary under the Doyle Administration.